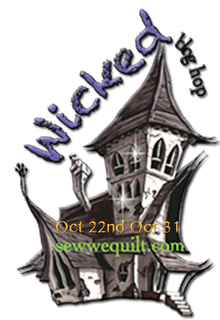 I was hesitating to sign up for this blog hop, since I'm not into the scary part of halloween, but I'm a sucker for a good blog hop! so why not? I searched for pumpkin and a few blocks came up, one was this funny scrappy pumkin. 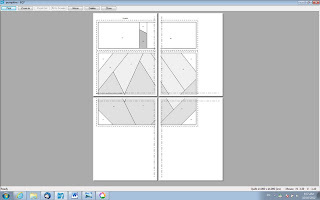 Now the block is 12" so when I printed this, it overlapped into another page (or rather 4) there was no way to MOVE it, I did move the large section down to just be on 2 pages and printed them like this. 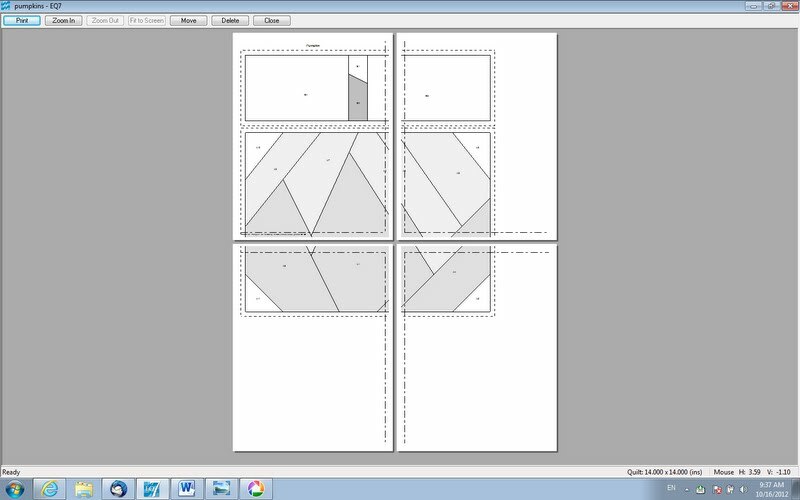 I did move the large section down to just be on 2 pages and printed them like this. I had enough black fabric and lots of fiberfill, so I quickly made a pillow! Have fun hopping this last day! It folds open can fit 4 large pictures and 12 small ones, great for pics of the halloween costumes! 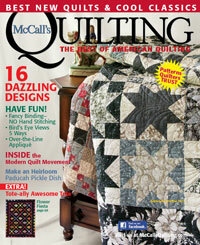 Also, if you DON't have this sept/oct issue of McCall's quilting, I have a few issues left. All you have to do is comment on this post, if you just want ONE item or the other let me know, otherwise I will pick just one winner for both items. I'd like to be counted for the album please! or the books. Either would be very good. Love your block, Bea! Pumpkins rock! How cute Sonja looks with your pumpkin pillow...fun project TFS! I'd love to win the magazine..autographed, of course!!!! Thank you for sharing such a great tutorial and block. And all your other lovely projects of the season - just love your owls! I would love the magazine and thank you for hosting. Thanks for sharing all your great fall projects and the tut on EQ. I would love to have a signed copy of the magazine. If I win the magazine it has to be signed! Your block is beautiful and will keep through Thanksgiving. I really like your leaf quilts too! Thanks for sharing. I like your pillow and also all the other stuff you have made over the years particularly those owls and the ones on your blog header! If I win I would love a signed magazine please - have seen that picture before were you in the Amys Creative Side hop? Thanks for sharing. I would love a signed copy of the magazine! Love the items you made, especially the paper-pieced pumpkin and the owls. What a great Halloween display, I love your pumpkin cushion and all of your other fabulous projects...especially the owls. I love your pumpkin cushion and of course Sonja looks so cute too! Great giveaway - count me in please! Lovely quilting Bea. And the baby on the pillow is soooo cute! Your pumpkin block made a terrific pillow and I enjoyed seeing your other fall projects. I would be very happy to win both ,thanks for the chance. I love your project but those owls are to die for! I love your pumpkin block and the other quilts you showed us, especially the owls. The pillow turned out great. Since I already have the magazine, the album would be my choice. lovely block! I need to start playing with EQ7 myself sometime! 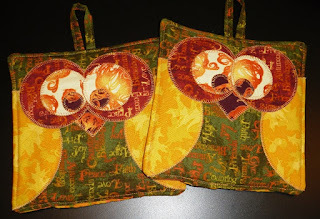 I enjoying your EQ projects.Lovely pumpkind pillow and owl and your kid is adorable!! I love the paper pieced pumpkin . I am going to try it today . Thanks for the chance to win. Your block is great..I have never used EQ. It looks interesting though. I would love your little album and the magazine signed by you...thank you. Paper piecing is on my Things I Want To Accomplish This Winter list, and your pumpkin is pretty cute! I'd love to have a signed copy of the magazine - I don't get that one and there is no place to even buy it around my neck of the woods. Happy Halloween! Oh! I love, love the leaf quilts! They are my favorite type of quilts and with the fall colors! Wonderful! I like your pumpkin block too and the baby is a doll! I'd like to win the Magazine! Love your project with the sweet little one :) and would love to be in the draw for a signed copy, congrats on being published!! Fantastic pumpkin! And your little pumpkin is a cutie too!! I would love to win the scrapbook. It is super neat, I've never seen anything like it. I just love the OWLS...always a Hoot. I'd be happy with any prize. Thanks so much for the fun! Your scrappy pumpkin is just perfect for the season! I love all your other projects, too! Your blocks turned out really nice. It was nice of you to have a give away. I have been following everybody all week and there have been some nice pieces. Wonderful pumpkin block, and lots of lovely fall projects to look at. Thanks for sharing!! I love your pumpkin pillow! And all your other fall projects, too! great post ... I have to play with my EQ7 more .... I did a little this summer when I was in the MQDS 2012, but only for those quilts now I have a little more time ;). Would love to have a signed copy of your issue of McCall's Quilting I thought that was a cute pattern when I was reading the magazine. That is the cutest, sweetest little pumpkin ever...and the pillow is cute, too! Cute Halloween pumpkin block out at night! You have quite a stash of lovely Fall projects! Thanks for a chance at your giveaway...the album looks interesting and I don't have the quilting magazine! Love all your quilts and the stuffed owls are just so cute. I would love to be entered for the magazine, signed of course. Love the owl quilt in it. Thanks for the chance and for sharing your quilts. 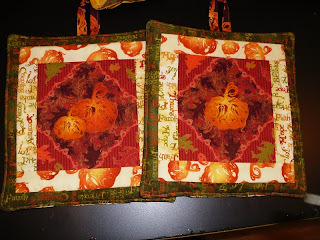 The pumpkin block is really cute--love it and all of the other fall projects you shared. 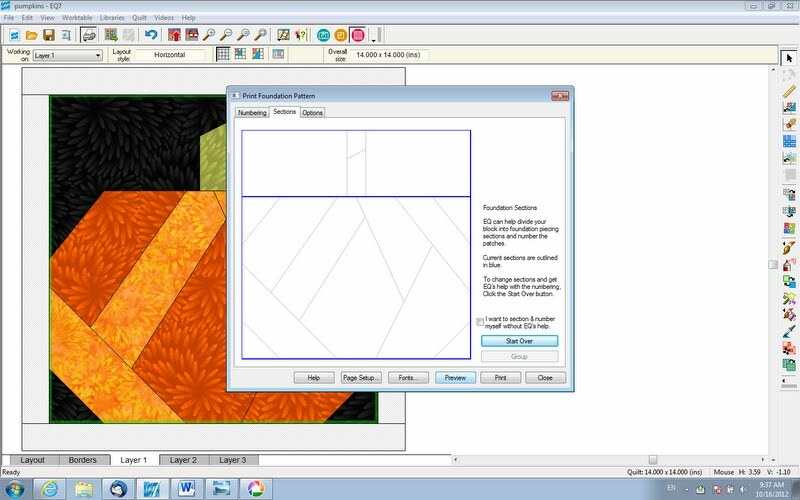 I've always wanted to do a maple leaf quilt but haven't gotten around to it. I would be honored to have an autographed copy of a magazine. My granddaughter is really into owls right now, so it would be fun to have another owl pattern. Hi!!! Very cute pumpkin block!!! Love your other fall projects too!!! The owls are adorable!!! Great give a way!!! Thanks for the fun!!! You have a wickedly wonderful cauldron of pretties! I love the leaf quilt, it's stunning! Can I have the squishy sweet girl as my choice? Seriously, she is too cute! I love your block!!! You made a lovely pillow of your pumpkin block! I like your other earlier work to, your owl design is so cute! The wee one on the pumpkin pillow is my favorite!! too cute!! Your pumpkin turned out very cute; I love the patchy look of it. I also love the look of Sonja! What a sweet baby! You sure do have lots of cute fallish things to decorate with even if you're not in scary. If you would choose me as a winner, just send the mag; I'd love to see you quilt in there. Love reading your blogs! Like all the tute's you're doing with the EQ7 program. Thanks for all the blocks/quilts you've shared already! Really nice display of Halloween items today, too! Thanks. Your pillow looks lovely! Not scary at all....but seeing the beauty leaning, I totally understand why! You made a lot of beautiful projects over the years. I especially loved the leafy quilt. It is fabulous! You did well! Love your pillow and the little child leaning on it. So cute. I would love to win a signed copy of the magazine. I collect owls. enjoyed your blocks. Thanks for being part. I don't have the magazine. Thanks. your Pumpkin is adorable, but I didn't realize how big it was until I saw Sonja next to it. And she is soo very cute too. Adorable pumpkin pillow and what at beautiful model, too. 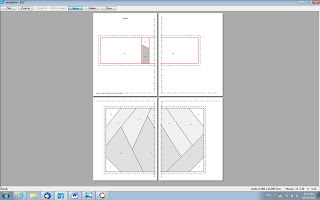 Thanks for sharing your project. Oooo... LOVE your pumpkin pillow (with cute baby), owls, and tesselating leaves. Beautiful projects all. Love your block Bea. And the baby is getting so big! Thanks for the giveaway,,I'd love either. Thanks for sharing. COOl, I love your scrappy pumpkin and the tips fom EQ. I have it and have hardly played with it. Lots of beauitful things here!!!! Have a scrap HAPPY Halloween!! Cute pumpkin pillow especially with Sonja leaning on it! Your past projects are beautiful also. I would enjoy a signed copy of the magazine with your quilt in it. I love your owls and your owl blocks. I'd really like to win the magazine with your quilt, as I couldn't find it here. Thanks for the giveaway! Very sweet pumpkin (and baby)! Love the fabric choices for your cute pumpkin. Thanks for sharing all your fun & pretty projects. I'd LOVE a signed copy of the magazine. The little album is adorable, but my kids are all grown so no little goblins to photograph at our house. Your pumpkin is something else. It really does speak of Halloween! I have to say the rest of your work is very nice. I think the McCall`s magazine would be very nice. I like your pumpkin pillow and the little cutie propped up on it! Your past projects are really nice too. Thanks for the giveaway. I would love to be included for the autographed magazine. Your pumpkin is fabulous. I love the fall colours. Your other projects look great too. I like the owls. I would love to win a signed magazine. Nice job on your pumpkin and you have the sweetest pumpkin on top of it!!! Hi Bea, it is nice to know you. I love your pumpkin block, so cute and wonderful and your explosion of amazingly wicked colorful and beautiful projects. Your baby is so cute, can I win her? I love the pillow and owl quilt. Love your pumpkin you designed as well as the other fall items you made. Thank you for a great giveaway and a chance to win. I'd love the autographed magazine and the album would be great as well. My grandson's birthday is Oct. 29,he just turned two years old and I could fill up that album, hehe. Would love to have a chance at the magazine, signed of course!! So much fun looking at all these creations! Thanks!! HOly smokes, woman, you're on a quilting rampage! Way to go--whipping up a pillow in no time flat! What a great pumpkin block Bea and I always love seeing your owls! Thanks for participating in the Wicked hop and for the giveaway! I'd love the autographed magazine! Hiya! Happy November!!! I love your pumpkin pillow, but love the little pumpkin leaning on it more ;). She's just so cute. I'd love to have either of the gifts, or both of them really. And I'd definitely want you to sign the magazine. Thank you for sharing with us, and for having the giveaway. Blessed be, hugs!!! Hi Bea! Cute pumpkin design. You've done some great festive projects! Just catching up on this blog hop! Love the pumpkin pillow you made, VERY CUTE!